One of my favorite memories of Morocco comes from seeing goats standing on the branches of argan trees, munching happily away. The argan trees grow in southwestern Morocco. In 2013, I saw them along the route from the coastal city of Agadir to Marrakesh. In 2015, I saw them along the road from Marrakesh to Essaouira. 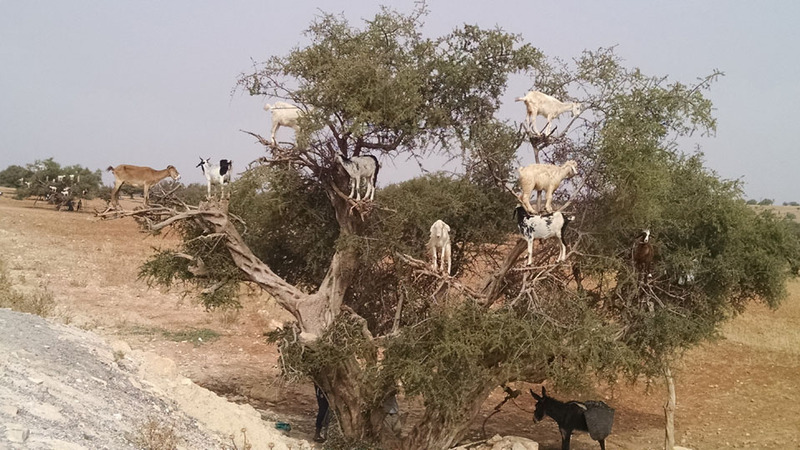 The goats have developed the ability to climb up into the argan trees in order to eat the fruit. These trees can grow up to 30 feet (about 10 meters) tall, and the goats will climb as high as it takes in their quest for a tasty morsel. According to an article published in Small Ruminant Research in July 2007, the goats spend over 6 hours per day on an average up in the trees. The fruits of the argan tree consist of a fleshy pulp that contains a hard seed at the core. The goats eat the entire fruit, but are not able to digest the central nut. The nuts pass through their digestive tracts, coming out in the poop. People recover the nuts from the goat droppings, and process the kernels to produce the argan oil that is so popular in hair care products and cooking. 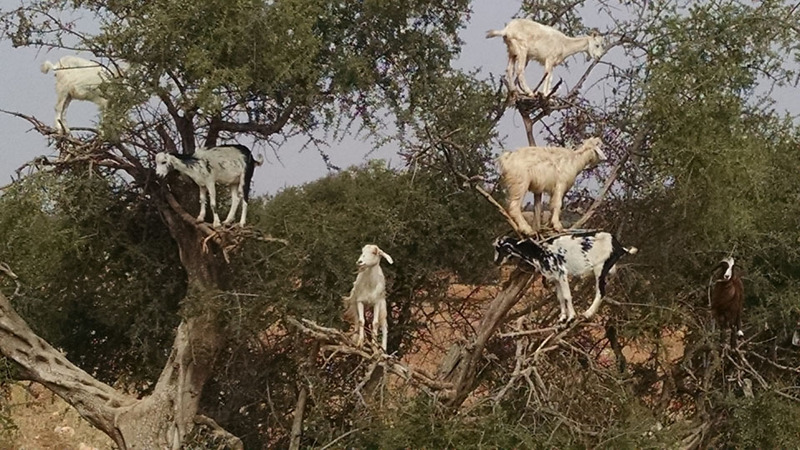 Goats pass time in an argan tree along the road from Marrakech to Essaouira. Photo copyright 2015 by Jewel. All rights reserved. In 2013, a tour bus taking us from Agadir to Marrakech drove through some countryside with argan forests, and the driver pointed out the goats as we passed by. However, to my disappointment he didn’t stop for us to linger, look at them, and take photos. When I was enjoying Marrakech with 3 friends in 2015, we were looking at options for tours, and found one offering a day trip to the coastal town of Essaouira. The tour’s description promised not only the sights to see in Essaouira itself, but also an opportunity to see goats in trees along the route there. The van picked us up at the meeting place, and we were on our way. It was a long drive in a cramped vehicle, so it was a welcome relief when it pulled over to the side of the road to let us out and see the goats. I realized that the tour organizers had arranged in advance with local farmers to herd their goats up into the tree just so we’d be sure of having some to see. Of course, it was suggested that we tip the herders…. I was happy to tip them. I was excited to finally be up close and personal with the goats!